Law enforcement’s response to a 9-1-1 call reporting a missing or abducted child begins with the telecommunicator who answers that emergency line. Whether referred to as dispatchers, telecommunicators or communications officers, the individuals who perform this bedrock first response to what may very likely be a critical incident truly hold the key to how well patrol officers and investigators are able to execute their work in the field. Shift work, significant overtime hours, ridiculous levels of multi-tasking and incredible stress – these are just a few of the hallmarks of the life and work of a law enforcement telecommunicator. 9-1-1 call centers and law enforcement communications centers across the U.S. often experience high turnover and chronic staffing shortages due to the demanding nature of the work. Law enforcement telecommunicators do so much more than ‘just answer the phone’ – they are handling multiple phone lines, dispatching and monitoring the status and safety of multiple officers in the field, and simultaneously entering large amounts of incident and operations information into local and state data systems. A critical component of this information management involves entering and querying data on criminal history record information through state systems which feed into the FBI’s National Crime Information Center (NCIC). The speed and accuracy with which NCIC and other record information is entered, updated and queried can literally make the difference - in the case of crimes against persons - between life and death. It can mean the difference between identification of child victims, their abductors or perpetrators of trafficking and exploitation; or missed identifications - meaning children are not rescued and perpetrators of crimes against them remain at large. In the midst of these realities, how can telecommunicators train and prepare for incidents of missing and abducted children? Telecommunications departments typically do not have robust training budgets, and often cannot afford to have personnel away from their shifts to attend classroom-style training outside the communication center. How can we ensure quality training is available to all telecommunicators, even in centers with tight training budgets and understaffed schedules? When children are abducted with the intent to kill, research shows that 76% of these victims are murdered within the first three hours. Research also shows there is typically a two-hour delay in reporting the child as missing. From the very moment the call of a missing child is received by the telecommunicator, law enforcement is in a race against the clock. Time is the enemy. Preparation is key. The AMBER Alert Training and Technical Assistance Program (AATTAP) recognized the need to develop comprehensive training that could be delivered through a flexible online learning platform and completed in a self-directed manner, allowing telecommunicators to work on the course anytime 24/7 in increments of time that fit their demanding schedules and workloads. In 2006, the National Center for Missing and Exploited Children (NCMEC) and AATTAP partnered to form a steering committee to include the Association of Public Safety Communications Officials (APCO), the National Emergency Number Association (NENA) and the International Academies of Emergency Dispatch (IAED). The committee developed and jointly endorsed a set of national best practice standards for call-handing and information management in these case types. 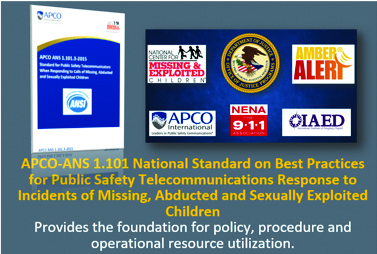 In 2007, the APCO-ANS1.101 National Standard for Public Safety Telelcommunicators When Responding to Incidents of Missing, Abducted and Sexually Exploited Children was first published; and was updated in 2010 and 2015. AATTAP launched the TELMAC online course in 2010, featuring the APCO ANS1.101 as a cornerstone of the training curriculum. The curriculum was borne out of key elements of classroom training NCMEC and AATTAP began offering to public safety telecommunications directors and their front-line supervisors and trainers in conjunction with the National Best Practice Standards project between 2006 and 2010. Another innovation resulting from the steering committee’s work to develop the national best practice standard is NCMEC’s Missing Kids Readiness Project (MKRP), which works with law enforcement departments and their communications centers to support their development of comprehensive policy for missing child response, and to ensure all command, investigative and patrol officers are fully trained. As part of that effort, the TELMAC online course, developed and administered by AATTAP, meets the front-line training requirement for public safety telecommunicators in those departments. AATTAP can deliver the TELMAC course as a full-day classroom training upon request for agencies or jurisdictions wishing to offer group training experiences. AATTAP also offers classroom and additional online courses for patrol, investigations and command personnel to support effective enforcement and investigative response to missing and abducted child incidents. The TELMAC online course has been completed by more than 20,000 public safety telecommunications personnel across the country, with scores of new registrants every month. Course updates have been made regularly to align with the 2010 and 2015 republications of the APCO ANS1.101, and to ensure other updates to research and available resources were incorporated into the training. Year over year since its launch in 2010, telecommunicators and other law enforcement first responders who complete the TELMAC course – whether online or in the classroom – report a 98.5 percent overall course satisfaction rating, as measured through questions on how well the course met or exceeded their expectations; expanded their knowledge regarding the scope, scale and nature of the problem of missing and abducted children; provided relevant and useful information and operational resources they can apply in their first responder work; and increased their confidence in being ready to respond when these incidents occur. In 2019, the TELMAC course and its companion course for patrol first responders, PATMAC, will launch fully updated versions featuring expanded video and interactive content. The classroom version of the TELMAC course has been enhanced also, and now features increased interactive exercises through the use of live polling technology, call audio analysis and a comprehensive tabletop exercise. The NCJTC offers a one-time online learning community registration, which then allows approved users to access multiple online courses for instant self-enrollment through Fox Valley Technical College’s Blackboard Online learning platform. The TELMAC course is part of the NCJTC’s Criminal Justice Professionals online community, and requires registrants to be employed by a criminal justice agency. For others working in community safety and child protection roles but not employed by an authorized criminal justice agency, the NCJTC offers a Community Training option which includes other online courses and recorded webinars. All of AMBER Alert’s online courses are self-directed, meaning participants can work on them anytime 24/7, at a pace or increments of time that best fit their schedules. Once all required course content is completed, certificates of completion are available for immediate download as a PDF file for use in training record documentation. For more information on registering for access to TELMAC and other online courses offered by AATTAP and NCJTC, email us at askamber@fvtc.edu or call 877/712-6237.